A recent economic survey undertaken at the behest of the Scottish Executive has confirmed that sport fishing (angling) in Scotland is worth over 113 million to the Scottish economy, somewhat to the surprise of the Executive exceeding the value of golf tourism. Of that 113 million the survey concluded that more than 65 per cent i.e. 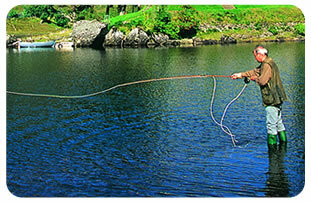 nearly 74 million was derived from salmon and sea trout fishing. The findings from this survey are being reinforced by the much more detailed data being provided by specialist fishing web sites which in time should provide detailed information on the exact value of salmon and sea trout fishing to the Scottish economy. (This must be good news for all those engaged in salmon and sea trout management and conservation). Orri Vigfusson, International Chairman of the NASF, continues to apply pressure on the Executive to ban all interceptory netting in Scotland, particularly those centred around the Montrose Basin. The NASF provided the catalyst in the raising of the 3.4 million to buy out the large proportion of the licences of the North East driftnet fishery and Orri has now focused on the remaining interceptory nets in Scotland. Once these are banned he can employ all his energies to curtail the Irish drift net fishery, which accounts for 200,000 plus salmon per year, many of them destined for the depleted rivers and lochs on our West coast. Orri also believes that with proper support and encouragement from the Executive it would be possible, in his view, to equal the 300 million that Scotland's fish farming industry brings to Scotland's economy: "Scottish angling could equal that and provide a much better long term sustainable framework for a wide range of activities both directly and indirectly linked to sport fishing as part of a wider tourist appeal. "The irony is that the lack of direct action by the Executive to underpin Scotland's salmon and sea trout fisheries is encouraging many long term Scottish salmon fishers to seek their fishing elsewhere. However, despite the overall decline in salmon and sea trout numbers, this year has provided something of a renaissance, with many rivers experiencing their best spring runs for many years. Indeed there is a much more upbeat feel about salmon fishing in Scotland. This is probably in part due to the NASF's efforts on the high seas, but sadly is unlikely to shame the Executive into action in the short term. 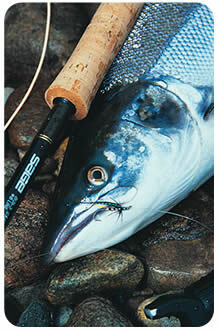 To find out more about fishing opportunities around Scotland then please have a look at our sporting website.